How to draw minion dragon Here I have today is another dragon monster creature design tutorial. This design I came up with the thought of this little creature would be a minion and there could be hundreds and thousand of them surrounding one big dragon. This creature is a specific type of dragon, they are mini dragons that serve the giant dragon. The minion dragon is a follower devoted to serving its master dragon relentlessly. This one is an older one of mine and it took me a few days to pulled it off. It is one of the more well thought out than most of my speed painting. 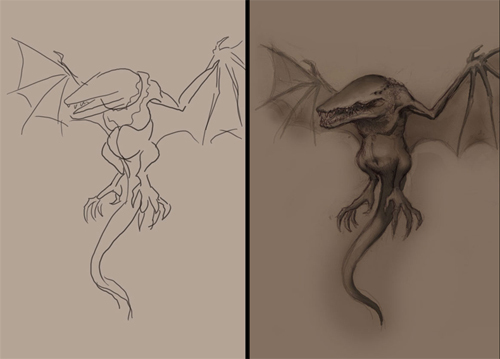 What is the essential element when you design a creature? If you want to design a good, convincing and life like then you will have to come up with good idea and some research. Good idea will often produce a good result. First you have to think what kind of environment this creature dwell. Then is it a predatory type or something else. If it hunts what would be its strategy. What kind of presence does it has? Is it creepy, intimidating, or adorable? Can it fly or is it bipedal, or else? Lots of element to think about but you have to narrow it down. Like on this example here. I suppose to create a creature that hunt during the night. That’s the only requirement and the rest I can just use my imagination. I like open end topic. So First off I think of what kind of animal in real life hunt at night and base on that I can borrow a lot of main feature that it has and use it as a base of my initial concept of thought. I came up with a “BAT”. Then I start looking around for other kind of creature that look intimidating when you encounter, I am thinking crocodile. So I am going to borrow some of the feature from the crocodile. And the rest I will just made them up as I goes. Since it only hunt only on the darkest night, it might not need any eyes so I will just give it none. It will look even none earthy and more creepy. What kind of strategy will it use when it hunt? 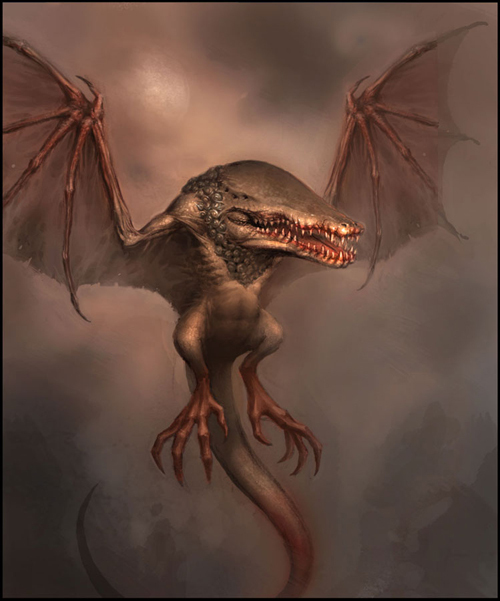 I am thinking unconventionally now so I will make it use its electric tail which can paralyze it prey at touch with fly by then shew it up with its strong jaw and super sharp teeth. When I have a few element that lead to a clear picture of it, now I can begin to sketch or thumb nails. At this stage, you can still change your mind about things, you can change from bat to owl, cat, etc. Or change crocodile feature to eagle, turtle, etc. Change it around and play with it until you can come up with something you think it’s cool! 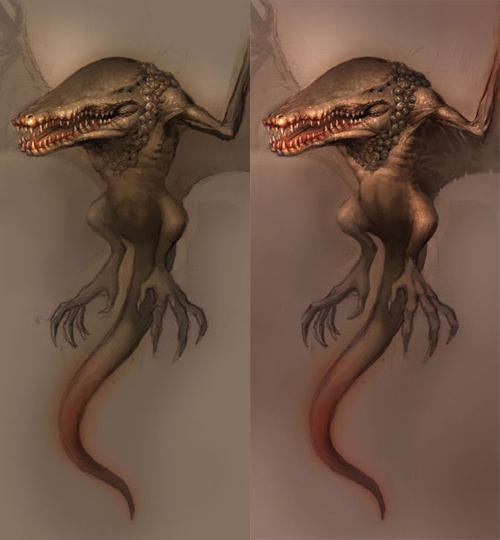 Here is the final concept minion dragon. It looks a bit like crocodile bat. 1) I start of with a really loose sketch. I usually thumbnail a few then I pick one from three or five. I give it mostly bat like feature, wings, body. Then I add Crocodile mouth, some sort of bird of prey big craws, and tail. And to add some fun element I give it a belly in the beginning. 3) At this point, I assign the skin color of the creature. I choose something every earthy and base on reality like brown toward green hue like of lizard or reptile like skin. Then I begin to establish where would the strong light hit. Whether it will be On top of its head, nose, stomach, shoulder, etc. Also you should think in term of where would be the area that you can put lots of detail and where should be the area to leave audience to rest and also establish the focal point. It’s important at this stage because when you have a good foundation and it reads well, the rest (if you don’t make any mistake or go over board) should be easier to fill in. 4) After I am happy with the overall foundation of the image I then go in to give it some detail painting. I often use reference images I found then paint to mimic the looks. 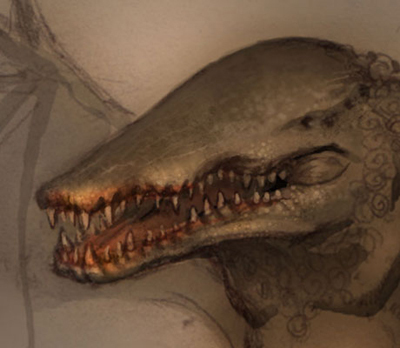 In this case, I have a few good crocodile’s head pictures to look at while I am working on its detail. As you can see, I try to give its skin dimension, rough, and crocodile like texture. You can also make you own custom brushes to make your job easier because you will be using it for the rest of the painting. So you can take sometimes and create a few, they will come in handy later on also on the future project you have. (you can look at PS custom brushes tutorial on the internet, but I am planing to make one soon, I hope) Anyway, reference is very useful when you want to create something life like and real. 5) After you have your first section detail out, then you can work around it. Usually the highest detail part or the highest contrast will be around the focal point. So just work your way around the area. On this one, I work my way around the mouth/ jaw area then down to the shoulder, work out the detail. It is important to make sure that you use the correct value and maintain your value throughout the area. You can test it by make an adjustment layer on top turn it into gray scale to check your value. If it doesn’t look wrong it gray scale, then you value should be fine. 6) Same thing here, I just work my way through its arm, body and then the rest of the body with the existing value. 7) As I try to work my way through, the further away from the focal point I tend to make it simple, but maintain the readability. Simplify, not everything in the image has to be flesh out, too much detail will kill your image. Leave big shape or space for viewers to rest their eyes. Composition, solid drawing and correct value is way more important than the overly detail image. Make it interesting to look at, don’t go over board with unnecessary detail. 8) Now I basically work my way throughout the whole body. If you notice most of it are simple two to three values, and only certain part I selected have highly detail. Use shadow or dark to your advantage, to make big shape and to help simplify the image. Then I start adding background, in this case, it is a foggy night sky with a moon lit on it. It’s very simple. When you work on the background, it is you chance to find hard edge and soft edge. If you can use edge well, you image can be even better than it already is because edge is one of the most important key element in painting. 9) Finally, I look at the overall image and touch it up here and there to bring out my focal point, simplify and clean up edges. Recently, I try my best to simplify the image and its value as much as I can when finishing up. I found simplicity to be the way I should really aim for to grown as an artist. Keep it simple, but well executed! Here is the final concept minion dragon. Well hope that help some of you, and have a great day!